transverse waves which will polarise, refract, diffract, interfere and show theDoppler effect. they need no medium or material to pass through. all produced by rapidly accelerating or oscillating electric charges. In fact the boundaries between these waves are far from precise. The names depend more upon the way they are produced rather than exact properties. Because this is a spectrum there are gradual changes in the properties as the wavelength and frequencies change. The properties given and the uses we have for the different wavelengths are therefore general rather than exact. There is one very narrow band of waves which can be more closely defined (although still not precisely) and that is visible light. That is really an extremely narrow band from 3 x 10-7 to 5 x 10-7 m in a range that goes from over a kilometre to the diameter of an atomic nucleus. The descriptions work down from the longest waves to the shortest. There is a PDF copy of the main notes which is easy to download and print. Radio waves roughly from up to 100Km down to a 10 mm wavelength produced by electrons oscillating in a conductor (a wire) used for message and music transmission. Shorter radio waves used for television signals. Microwaves wavelength from about 1 m down to 1 mm, note this overlaps radio waves. Used for straight line or short distance communication (eg mobile phone to mast and satellite to satellite dish) and for radar. Also used in cooking as some wavelengths excite water and fat molecules. Infra Red radiation is associated with radiated heat. These waves are emitted from “warm” surfaces. (they don’t have to be very warm but hot surfaces like the sun create a lot). Wavelength in the range from 1 mm down to 700 nanometre (nm). We use infra red radiation for remote controls and cooking. We observe infra red with night vision cameras to detect people or animals in the dark. Visible light is the very narrow range fro red at 740 nm to purple at 380 nm. We have presumably adapted to use this range for several reasons. One because there is a lot of this radiation available during daytime. Also the wavelength is short enough to avoid significant diffraction, which would cause blurring, through a small pupil.Some animals, for example snakes can use infra red to detect prey and some insects, for example bees can see into the ultra violet range. Ultra violet (UV) radiation is in the range 400 nm to 10 nm. It is produced by very high temperatures such as an arc lamps and mercury vapour lamps. About 10% of the Suns radiation output is UV. Short wavelength UV can cause ionisation of atoms and can therefore be dangerous causing burns (sunburn) and sometimes cancer. However UV light induces the production of essential vitamin D in our skin. Detergents commonly include chemicals which fluoresce in sunlight to make washing seem whiter and banknotes may use marking with the same type of chemicals so that they show up under security UV lights. 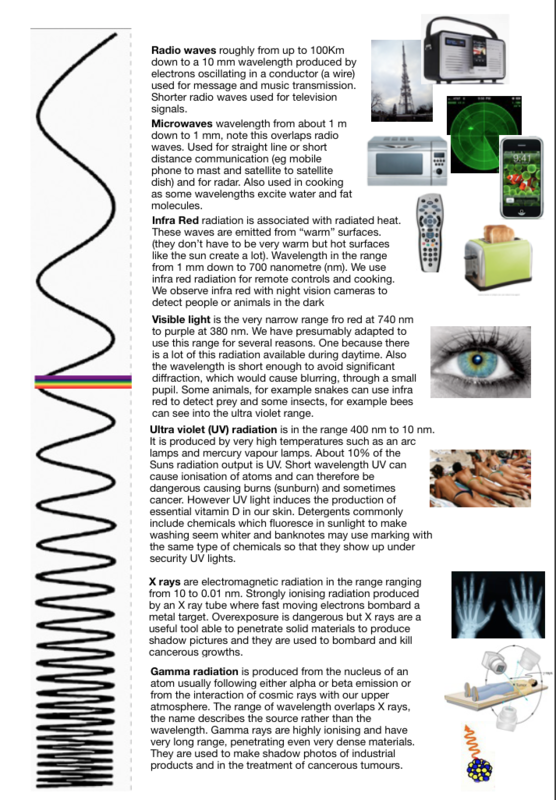 X rays are electromagnetic radiation in the range ranging from 10 to 0.01 nm. Strongly ionising radiation produced by an X ray tube where fast moving electrons bombard a metal target. Overexposure is dangerous but X rays are a useful tool able to penetrate solid materials to produce shadow pictures and they are used to bombard and kill cancerous growths. Gamma radiation is produced from the nucleus of an atom usually following either alpha or beta emission or from the interaction of cosmic rays with our upper atmosphere.. The range of wavelength overlaps X rays, the name describes the source rather than the wavelength. Gamma rays are highly ionising and have very long range, penetrating even very dense materials. It is used to to make shadow photos of industrial products and in the treatment of cancerous tumours.